Are you committed to contributing to the global struggle for justice? Apply to work with NISGUA! Positions available until filled. 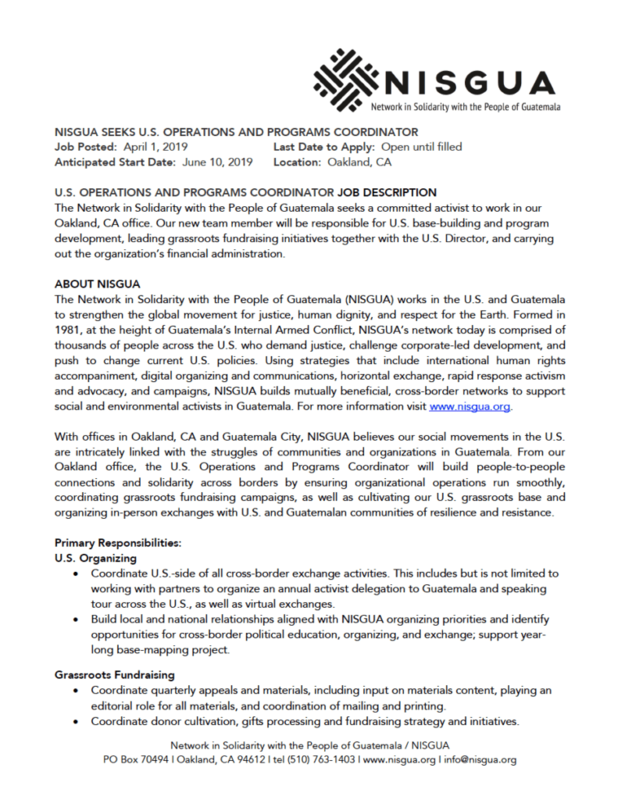 The Network in Solidarity with the People of Guatemala seeks a committed activist to work in our Oakland, CA office. Our new team member will be responsible for U.S. base-building and program development, leading grassroots fundraising initiatives together with the U.S. Director, and carrying out the organization’s financial administration. Our accompanier recruitment cycle for 2019 is now closed! Please visit the Guatemala Accompaniment Project section of our website for information on accompaniment and how to apply for future cohorts. NISGUA welcomes unpaid interns to work out of our U.S. office and provides an opportunity for them to work on substantive projects within a number of different program areas, including publication of activist materials, campaign and program development, and research on key human rights topics. 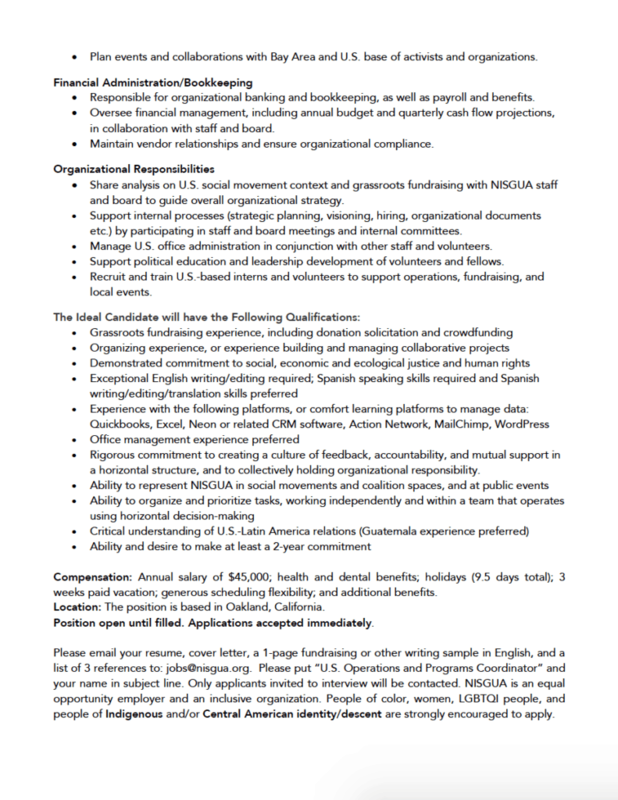 Other tasks may include written translation, event or delegation organizing, monitoring of the Guatemalan press, and updating activist materials. The minimum internship length is three months, and interns are asked to commit a minimum of 20 hours per week, preferably in the morning and early afternoons. Applications are accepted on a rolling basis. Qualifications: Interest in Guatemala, commitment to social change, ability to work independently and with others. Strong writing and oral communication skills. Email organizer@nisgua.org for more information on how to apply! Ready to explore an internship with NISGUA? Fill out our internship application today! We’re looking for a committed volunteer to provide weekly support to our Communications Coordinator in developing and organizing a web-based archive containing over a decade of NISGUA photographs. Project includes selecting images from the archive for use in NISGUA promotional materials and across social media platforms. Can work remotely. Must have access to a computer. Commitment: 1 month minimum, about 1-2 hours per week. Do you love doing research? We’re looking for a volunteer to work alongside our GAP Director on a one-time project to expand and improve outreach for our international volunteer program, the Guatemala Accompaniment Project. Can work remotely. Must have access to a computer. Commitment: 1 day, about 3 hours. Do you have a background in non-profit development or grant writing? We’re looking for a committed volunteer to support us in researching and identifying small grant opportunities to support our work in the areas of: international human rights accompaniment, environmental justice, and grassroots exchange. Can work remotely. Must have access to a computer. Relevant experience required. Commitment: 1 month minimum, 1-2 hours per week. We’re looking for a committed volunteer to provide ongoing data management support to our U.S. Operations and Programs Coordinator. Volunteer will directly support NISGUA’s grassroots fundraising efforts by improving the accuracy of our donor database. Can work remotely. Must have access to a computer. Commitment: 1 month minimum, about 1-2 hours per week. Ready to volunteer? Fill out our volunteer application today!